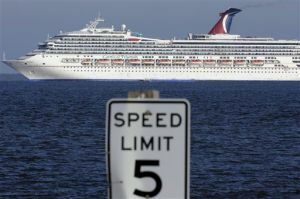 The cruise ship Carnival Triumph is pushed towards the cruise terminal along the Mobile River in Mobile, Ala., Thursday, Feb. 14, 2013. 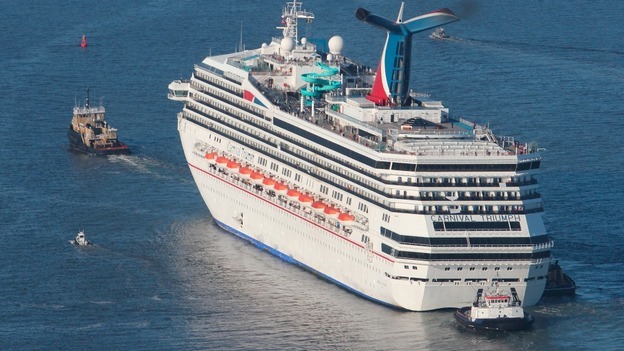 The ship with more than 4,200 passengers and crew members was idled for nearly a week in the Gulf of Mexico following an engine room fire. MOBILE, ALA. — A cruise ship disabled for five nightmarish days in the Gulf finally docked with more than 4,000 people aboard late Thursday, passengers raucously cheering the end to an ocean odyssey they say was marked by overflowing toilets, food shortages and foul odors. “Sweet Home Alabama!” read one of the homemade signs passengers affixed alongside the 14-story ship as many celebrated at deck rails lining several levels of the stricken ship Triumph. The ship’s horn loudly blasted several times on its final docking approach as some gave a thumbs-up sign and flashes from cameras and cellphones lit the night. About an hour after the ship pulled up at 9:15 p.m. Central, a steady stream of passengers began making their way down the glass-enclosed gang plank, some in wheelchairs and others pulling carry-on luggage. One man gave the thumbs up. An ambulance pulled up to a gate at the bottom of the gang plank and then its lights went on and it pulled away. A few dozen relatives on the top floor of the parking deck of the terminal were waving lights at the ship as it carefully made its way alongside. Those about were screaming, whistling and taking pictures. Hundreds gawked from dockside at the arrival at the Alabama cruise terminal in Mobile, the state’s only seaport, as the Triumph docked. Taxis were lined up waiting for people, and motorists on Interstate 10 stopped to watch the exodus of passengers from the cruise ship. It took six grueling hours navigating the 30-odd-mile ship channel to dock, guided by at least four towboats. 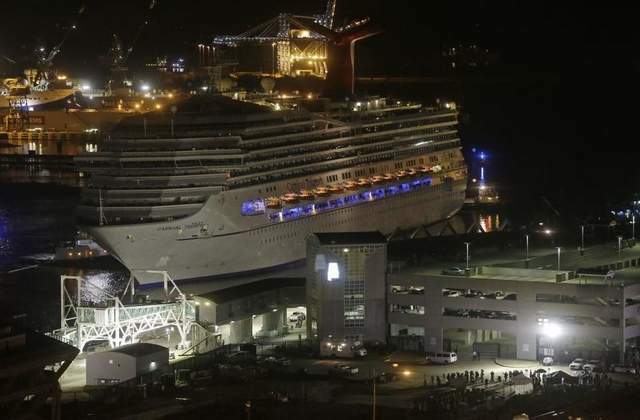 Nearly 900 feet in length, it was the largest cruise ship ever to dock at Mobile. It will take four to five hours for all the 3,000 passengers to be off, said Carnival senior vice president of marketing Terry Thornton.